Greetings from the Burgh, where it feels good to be back home, but after paying the rent and Virginia travel costs, I am once again broke. It’s Payday, spare a few bucks for a labor reporter to buy a beer if you can. The past few weeks have seen a round of devastating layoffs. HuffPost laid off a dozen veteran reporters including Pulitzer Prize finalists Jason Cherkis and Laura Bassett, whose reporting on murdered nuns in Baltimore inspired the Netflix series “The Keepers.” Meanwhile, Buzzfeed laid off over 200 reporters. Gannett, which owns The USA Today, The Indianapolis Star, The Louisville Courier-Journal, The Arizona Republic, The Des Moines Register, and The Tennessean among over 100 newspapers laid off 400 people recently. Today, VICE announced that it intends to lay off 250 workers. Additionally, McClatchy Newspaper, which owns the Miami Herald, the News and Observer, the Sacramento Bee, and the Lexington Herald-Leader announced it plans to shed 450 jobs; first through buyouts and then later perhaps through layoffs. More layoffs are expected in the media sector as Facebook and Google have a severely limited amount of ad revenue these papers receive. While the corporate media crashes and burn, we at Payday Report are slowly building an organic farm to produce high-quality labor reporting that you can’t get anywhere else. This week Payday was one of two national outlets to cover the Virginia Teachers’ Walkout. (The other outlet is The Washington Post, whose readership is heavy in Northern Virginia and has a Richmond bureau to cover state politics). As a result of our of readers’ support, we were able to produce 7 stories on the walkout including two dispatches for the Guardian. We will have an additional long-form story coming out next week on what’s next in Virginia. However, after paying rent and the travel bill to Virginia, I am flat broke so if you can, donate to Payday and let us enjoy a fun weekend back in the Burgh. In response to growing activism by the state’s teachers, Virginia Governor Ralph Northam has proposed a 5% raise for the state’s teachers; the highest raise in nearly 15 years. However, the catch is that local municipalities would have to put up matching funds to pay for the raise; a move which is unlikely in many of the poverty stricken districts in the state. “Do I believe that every locality in the Commonwealth will implement a five-percent salary increase for school staff? Absolutely not,” the Virginia Education Association’s Kathy Burcher told Virginia NPR station WVTF. While the state debates how to increase education funding, a new poll by Virginia Commonwealth University shows that 63% of the state supports increasing taxes to pay for increased education spending; the highest level of support for increased taxes since VCU began taking the poll 16 years ago. However, so far legislators from both sides of the aisle are proposing tax breaks. “Right now lawmakers are discussing what to do with new revenues that include $1.2 billion from recent federal tax changes, $550 million from overall growth in Virginia’s economy, and up to $93 million from collecting online sales tax from out-of-state vendors” wrote The Commonwealth Institute Policy Director Chris Duncombe in a blog posted on the site’s think tank. “Yet instead, on the very same day teachers rallied at the Capitol, the House Finance Committee advanced Del. Jones proposal (HB2355) to fence off nearly $1 billion in revenues into a “Taxpayer Relief Fund” that will materialize as tax cuts at some later date – perhaps right before the November election for which all House members will be running (here is the vote)’ wrote Duncombe. “Fast forward two days later, Senate Finance Committee members advanced Sen. Norment’s proposal (SB1372) on a party line vote (here is the vote) to give away almost $900 million of these revenues, including $420 million in the form of checks ($110 for individuals and $220 for couples) that will get sent out in October – yes, right before the November election for which they will also be running”. For more check out the Commonwealth Institute’s blog. 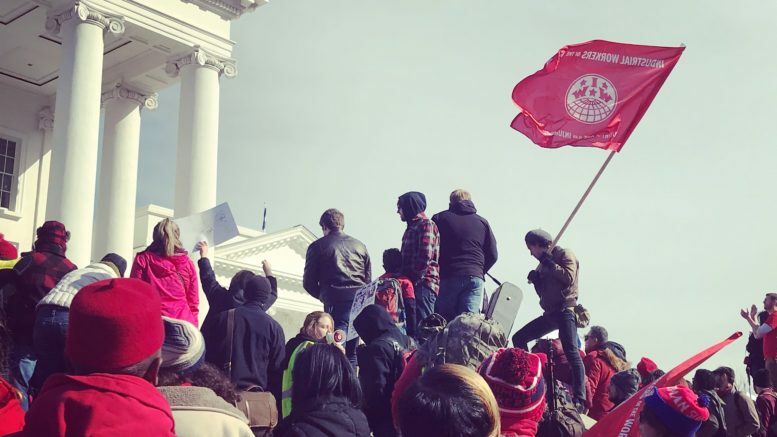 Two days after protestors packed the State Capitol demanding that teachers be paid fairly, a bill that would have allowed municipalities and counties to remove Confederate monuments died in the Virginia House of Delegates. The bill was voted down in committee by a measure of 2-6. In September of 2016, Payday profiled a dramatic comeback victory in Memphis, where the IBEW was successful in organizing an Electrolux factory on its second try. This week, Electrolux announced that the plant would close in two years; laying off 550 workers. Initially, the union suspected that the closure may be linked to the plant unionizing, but after examining the situation declined to file union busting charges. As part of the union drive at Electrolux, the company agreed to neutrality. Now, the IBEW is seeking to unionize a nearby Electrolux plant in Springfield, Tennessee, where most of the production is expected to shift. The building trade unions, along with 32BJ SEIU—one of the city’s strongest and most aggressive unions, which covers property service workers—announced their support for the HQ2 project. Amazon had agreed to use union construction workers, and to uphold an existing agreement that 32BJ had in place to use unionized security and building workers on its site, although, crucially, none of those workers would be direct employees of Amazon itself. On the other side is the Retail Workers union [RWDSU], which has launched a campaign to unionize a new Amazon warehouse on Staten Island. Along with the Teamsters and a broad coalition of community and labor groups, the RWDSU has been loudly opposing the Amazon deal and its bestowal of huge public subsidies on a company with terrible record of opposing unions and treating workers poorly. This divide in the city’s unions came to a head this week when 32BJ held a pro-Amazon rally and the RWDSU and its allies held an anti-Amazon rally, all while an Amazon executive was telling the City Council that the company plans to opposeany union campaigns it encounters here. At age 34, in her early days as a trade economist at EPI, Lee debated Nobel laureate James Tobin at Yale University. She notes that men have dominated the top ranks of economics and labor during most of her career. “That’s made me feisty,” she says as she flashes a coy smile from across her desk, cluttered with papers and notebooks. Her nickname at the AFL-CIO used to be “Big Labor” — because she’s 5 foot 2. And there’s no doubt Lee has a competitive streak, perhaps best exemplified by the 50-year Scrabble battle she’s had with her best friend since childhood, Adriane Fugh-Berman. Rush, 48, a soft-spoken woman with striking brown eyes, has straight-piped her family’s waste into her yard for almost two decades. Her home is on the edge of clay dirt road in the dense Alabama forest, miles from a municipal sewer system. Since Rush struggles with her health and is unable to work, she can’t afford the thousands of dollars it would cost to install an on-site septic system. This is her only option. In the rural South, these conditions aren’t uncommon. Many communities from the Black Belt to Appalachia lack basic sewage and water infrastructure. In economically distressed regions like Lowndes County, it’s led to a surge in poverty-related tropical diseases often found in developing countries. Doctors and researchers have observed significant levels of parasitic infections like hookworm and toxocara and conditions for mosquito-borne illnesses like Zika and West Nile. The risks are accelerated by erratic precipitation patterns and warming temperatures caused by global climate change. But local, state, and federal governments offer little funding to update infrastructure and local health departments have, so far, done little to address this public health crisis, forcing activists and researchers to address it themselves. For more, go to Southerly. — Finally, Vice has a great look at what happens when Latinx people gentrify Latinx communities. All across the US, once vibrant communities of color are vanishing and being replaced by hip and trendy predominantly white residents. But what happens when communities of color gentrify their own people? Vox dug into this phenomenon recently in its piece, “What Happens When Latinx People Gentrify Latinx Communities,” where Los Angeles’ Boyles Heights is struggling to maintain its origins after migration of Latinos from other areas. It’ll be interesting to see how this “gentefrication” (gente means people in Spanish) — a term coined by bar owner Guillermo Uribe — transforms the area in the coming years. For more, go to Vice. Be the first to comment on "Va. Gov Faces Criticism Over Teacher Pay Raise – Recently Unionized Memphis Plant Closes – Another Round of Mass Media Layoffs"